We’ve taken a stab at the most beautiful churches in the Twin Cities (there were a lot to choose from), as well as the best of the 52 Catholic churches in Stearns County alone, but this week we tackle the top 25 most beautiful and unique churches in the state. The thousands of houses of worship range from old and historic to modern and simple, but the most beautiful and amazing churches always have a rich history and incredible architecture. 25. 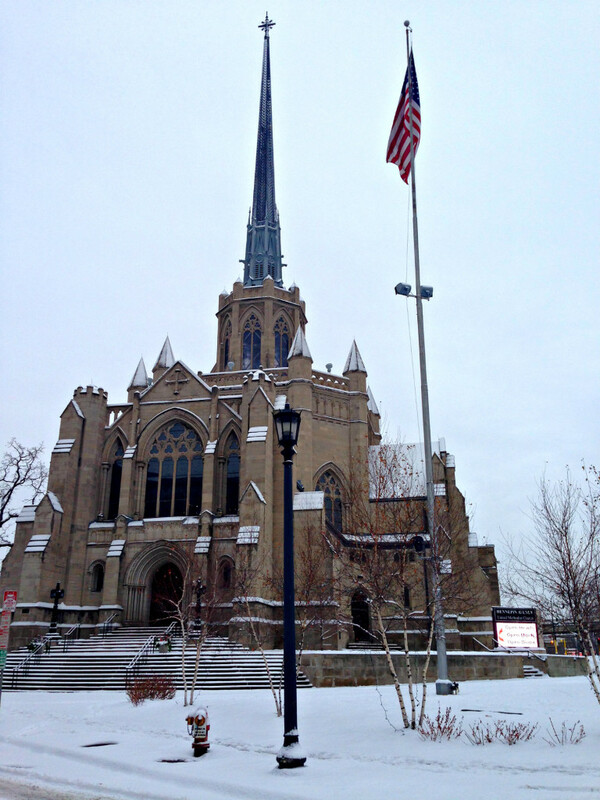 Hennepin Ave United Methodist Church, Minneapolis – The Hennepin Ave Church’s many pointed spires and central steeple are based on an iconic church in Cambridge, England. It was built around 1916 and features English Rural Gothic architecture. Its pointed center spire once made it the 2nd tallest building in Minneapolis. 24. Church of St. Mary’s, New Trier – Set on a hilltop in tiny New Trier (north of Cannon Falls), the Church of St. Mary’s dates back to 1909 and is listed on the National Register of Historic Places. The pretty little church on the hill displays the French Beaux-Arts style of architecture. 23. St. Andrew’s Church, St. Paul – No longer an active church, St. Andrew’s Church in St. Paul is now home to an arts academy. The beautiful brick structure features a mix of Spanish Mission Revival and Romanesque architecture, with colorful clay tiles on the roof. 22. Assumption Chapel, Cold Spring – Also known as the Grasshopper Chapel (more here), the Assumption Chapel was built in 1951 after the previous chapel was destroyed by a tornado. The Gothic-style structure on top of a wooded bluff has an interesting history- it was built in response to a last-ditch effort of a day of prayer to end a grasshopper (locust) plague that devastated the area in the 1870’s. Later that year,the grasshoppers died off, and the chapel was built in memorial. 21. Church of the Assumption, St. Paul – The Church of the Assumption is the oldest existing church in St. Paul, dating back to 1870. 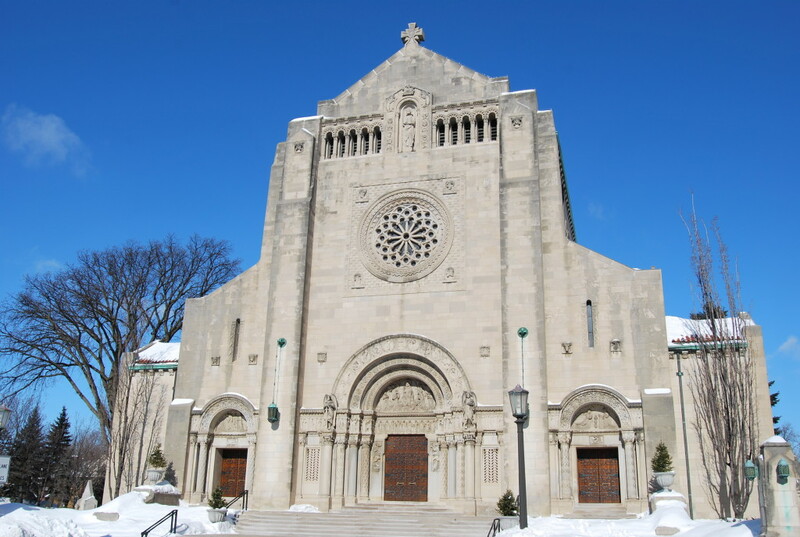 It was modeled after a church in Munich, Germany and built in the Romanesque Revival style of architecture common of the time. The dazzling interior has changed very little since the late 1800’s. 20. 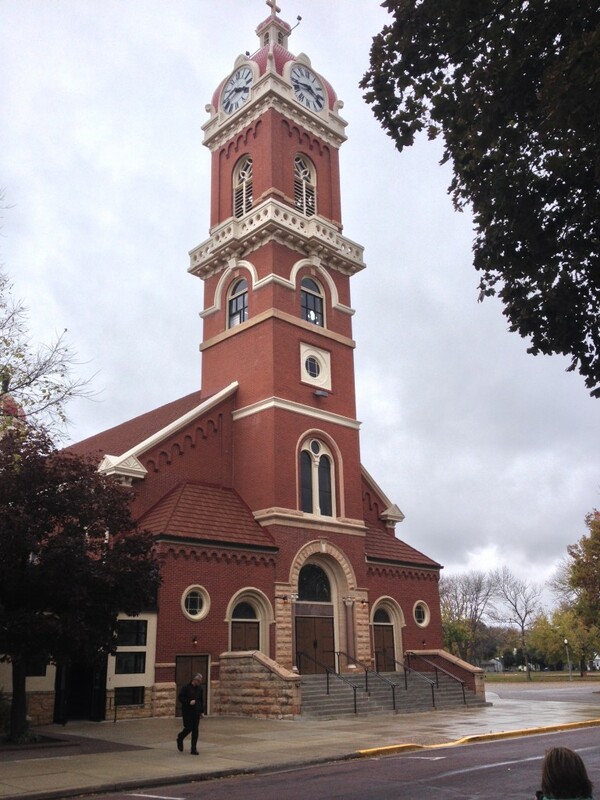 St. Mary’s Catholic Church, Waverly – The beautiful St. Mary’s Catholic Church in Waverly (just west of the Twin Cities), features Gothic Revival architecture, different shades of tan and red brick, and pointy spires flanking its two asymmetrical steeples anchoring each side. 19. 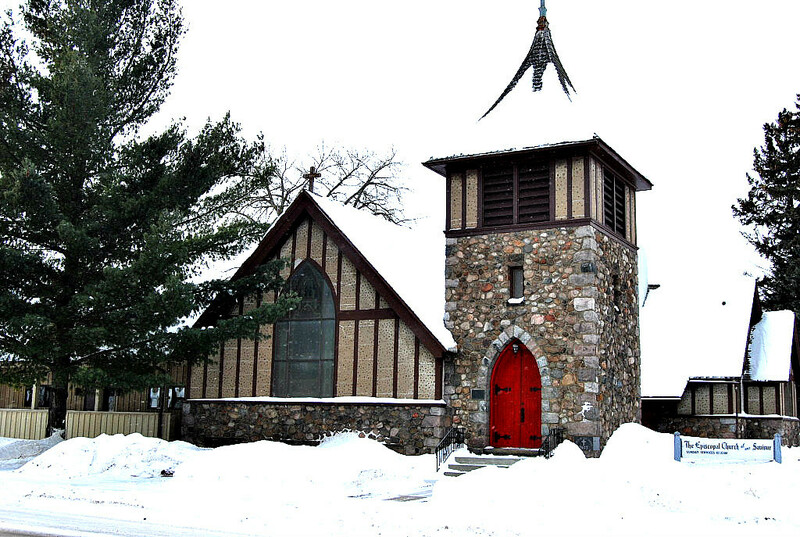 Episcopal Church of Our Savior, Little Falls – Built in 1903, the Episcopal Church in Little Falls features a blend of Tudor and Gothic styles of architecture with local fieldstone construction on the bottom section and half-timbered stucco design on the top. It was designed by architect John Sutcliffe out of Chicago. 19. 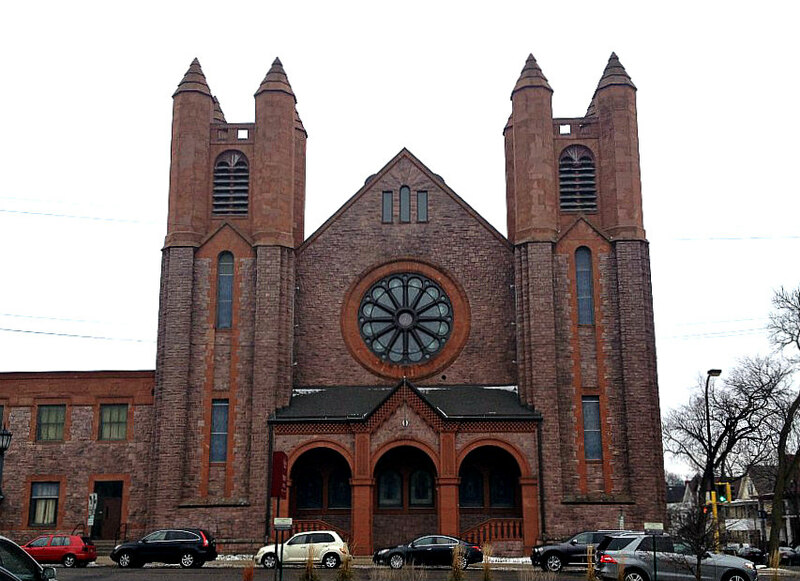 Fowler Methodist Episcopal Church, Minneapolis: Designed in the Romanesque style of architecture with its twin square steeples and brick archways, the Fowler Methodist Church was designed by famous church architect Warren H. Hayes in 1894. It stands in the historic Lowry Hill neighborhood just outside of downtown Minneapolis. 17. Church of Our Lady of the Angels, Sauk Centre – One of over 50 incredible Catholic churches in Minnesota’s Stearns County, this beauty in Sauk Centre is somewhat unassuming on the outside. 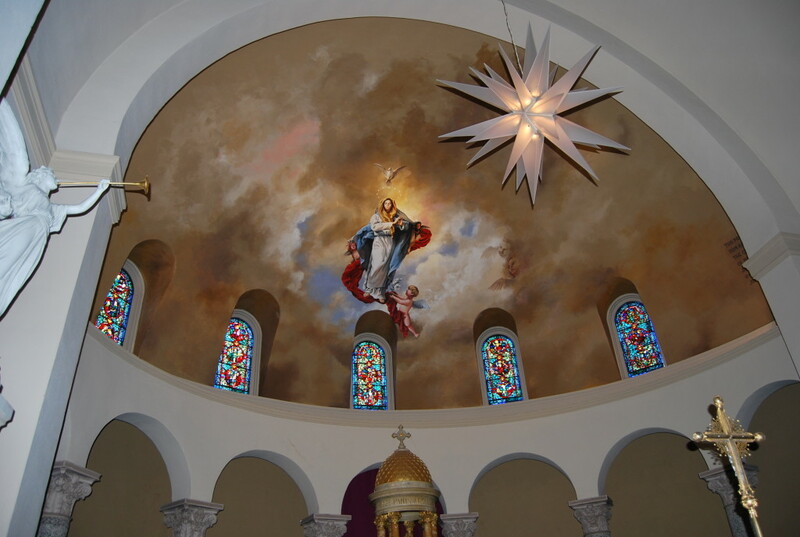 One of the most visually arresting interiors of any church in Minnesota, it features an incredibly vivid painting of Mary ascending through the clouds in its sanctuary dome. 14. 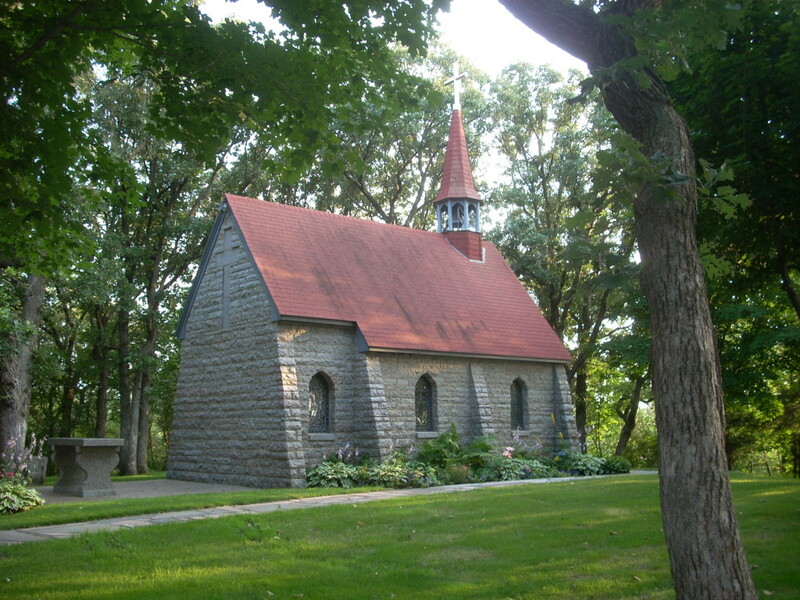 Stella Marie Chapel, St. John’s University, Collegeville – Set on the site of a former island (now a peninsula), and only reachable by hiking a mile or canoeing across Lake Sagatagan, the Stella Maris Chapel on the Campus of St. John’s University outside of St. Cloud actually replaced an earlier Gothic-style chapel that burned down in the early 1900’s. Built by Benedictine Monks from St. John’s Abbey in 1915, the quaint little Romanesque-style chapel is a picturesque scene, reflecting against the lake; a pilgrimage to it is a must for CSBSJU students, tourists, religious devotees, and anyone looking for that one-of-a-kind photo opportunity. 13. 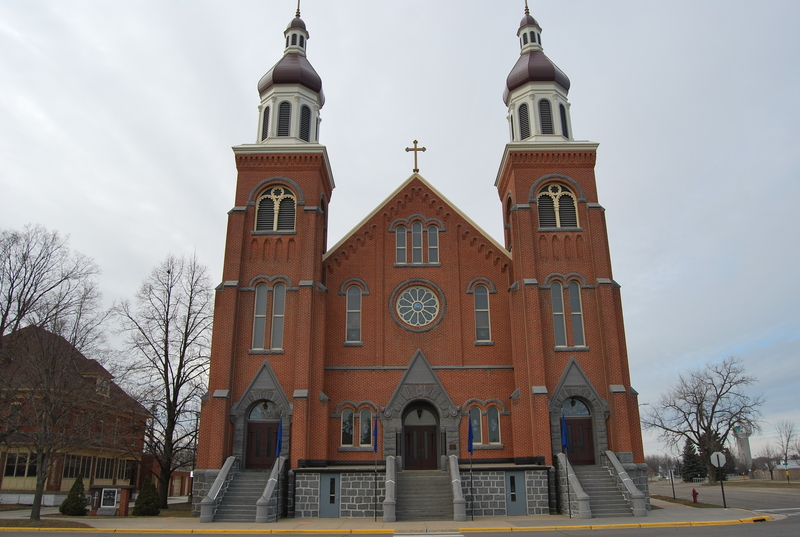 Christ the King Catholic Church, Browerville – Although Browerville technically is not in Stearns County, it certainly falls within the heavy concentration of Catholic churches built by the Polish immigrants who settled in the area in the late 1800’s. 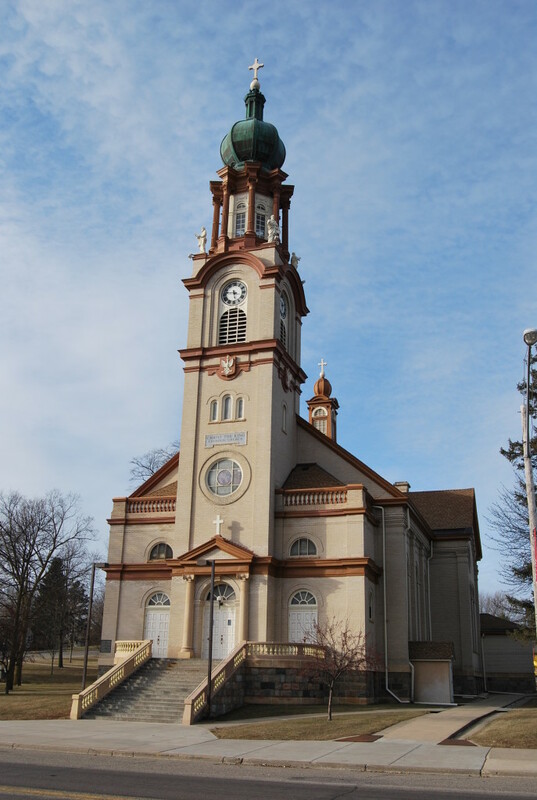 It stands tall and impressive on Browerville’s main drag through town, displaying the Baroque Revival style of architecture with its copper onion domes and ornate steeple. 12. 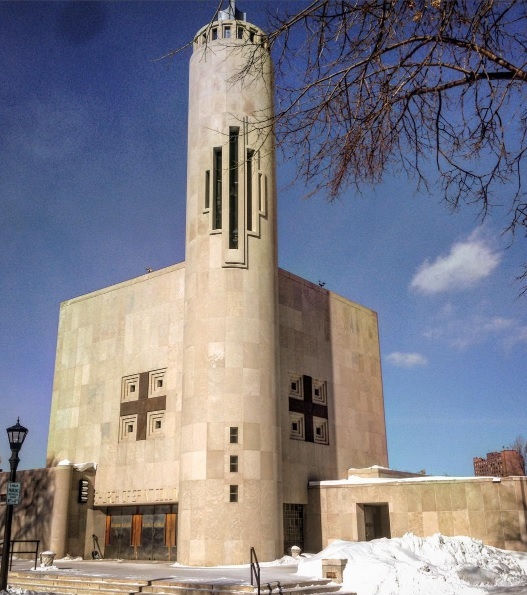 Church of St. Columba, St. Paul – This curious Church of St. Columba, found in an unassuming residential St. Paul neighborhood, is the only church on our list to feature and interesting mix of Art Deco/Moderne and French Norman-style architecture. It features a round, concrete steeple and squared-off corners built with Indiana limestone. The interior is very modern and beautiful, as seen here. This Christian church was built in 1950 and its parish history dates back to 1914. 11. Hopperstad Stave Church, Moorhead – The Hopperstad Stave Church in Moorhead was built as a replica of a Stave church in Vik, Norway, in 1998. It is located at Moorhead’s Hjemkomst Heritage Center, which also features a Viking ship located inside of the interpretive center. 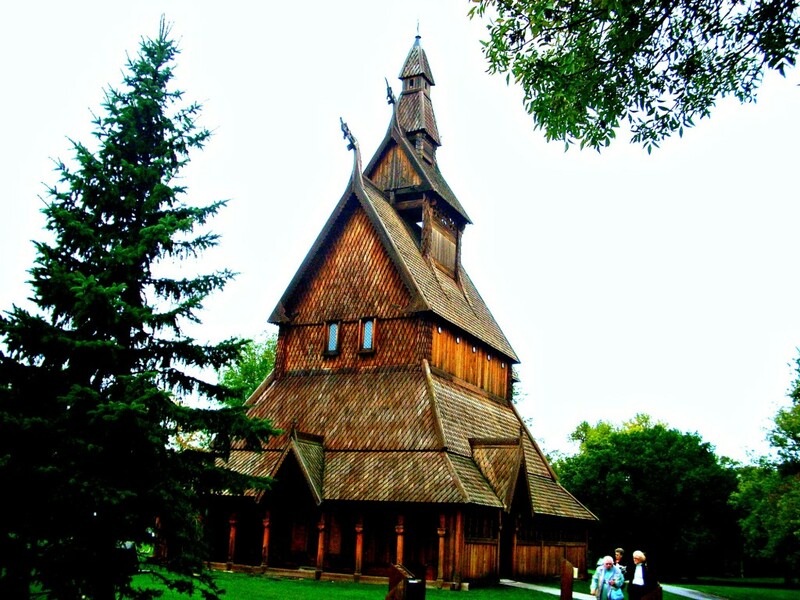 The Stave church sits in a lush, green park on the banks of the Red River of the North and features an incredibly detailed wood-carved interior. 10. 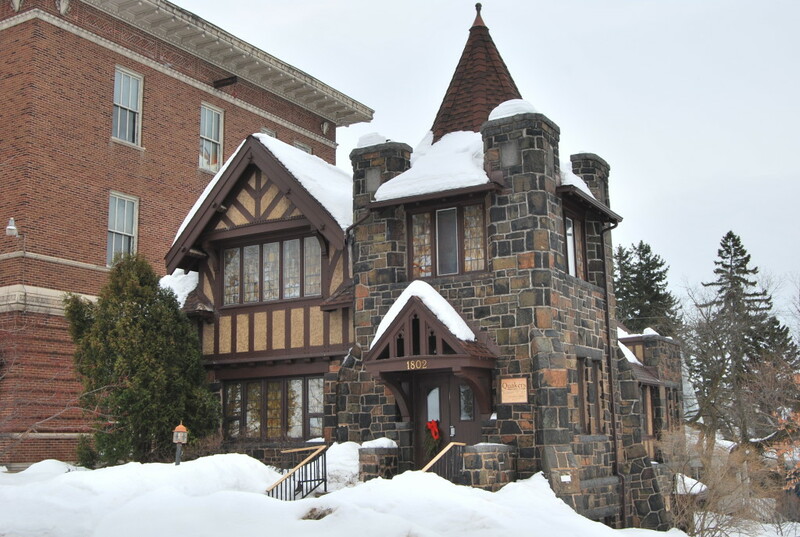 First Unitarian Church, Duluth – A little beauty found on a residential street in Duluth, the First Unitarian Church is a Tudor-style building with half-timber and stucco framework and locally quarried black granite. The unique architecture features stained-glass windows and a blocky, foursquare turret. It was built in 1910 and is currently in use as a Quaker church. 9. 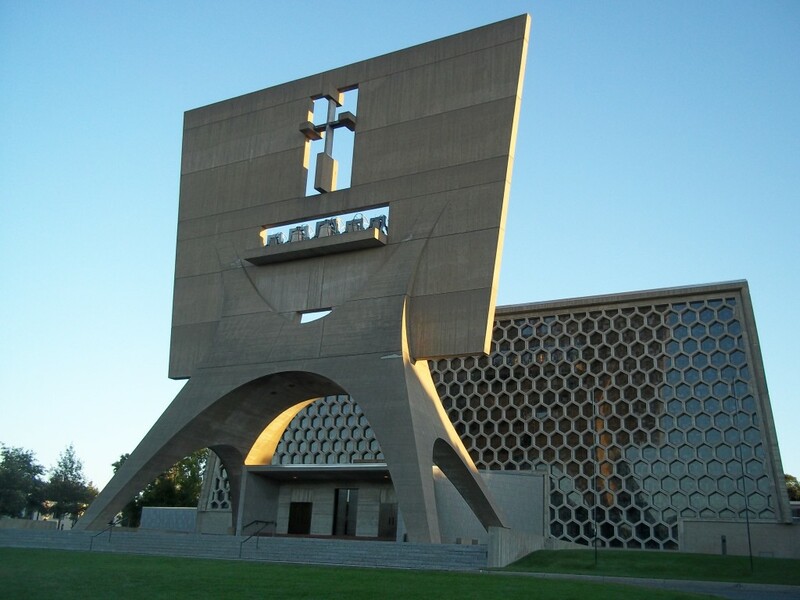 St. John’s Abbey Church, Collegeville – Bold and emblematic, the St. John’s Abbey Church at St. John’s University is the most modern on our list, built in 1961. Behind the 118-ft tall concrete bell tower is a wall of honeycombed stained glass windows – the largest such wall in the world. The interior is expansive and symmetrical, and devoid of the colorful and detailed art of the earlier Catholic churches in the area. 8. 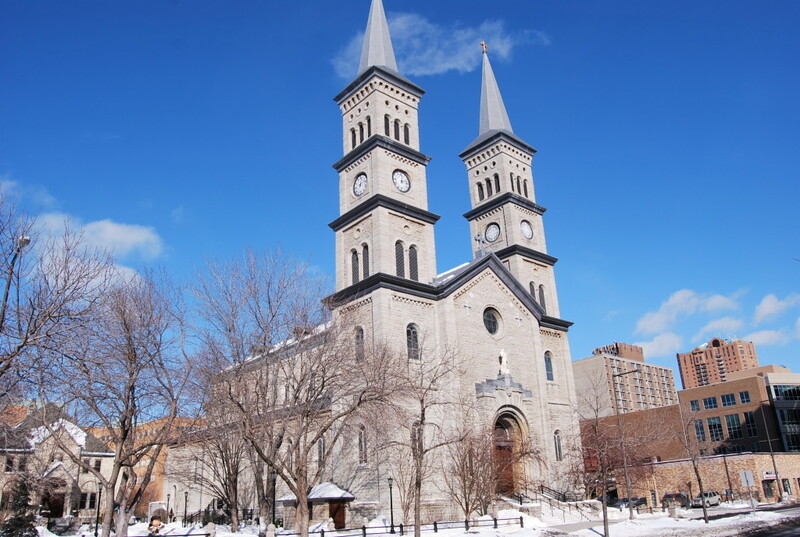 Basilica of St. Stanislaus, Winona – A prominent landmark in Winona, the remarkable St. Stan’s Basilica was designed in 1893 in the Polish Cathedral style with Romanesque influences as well. 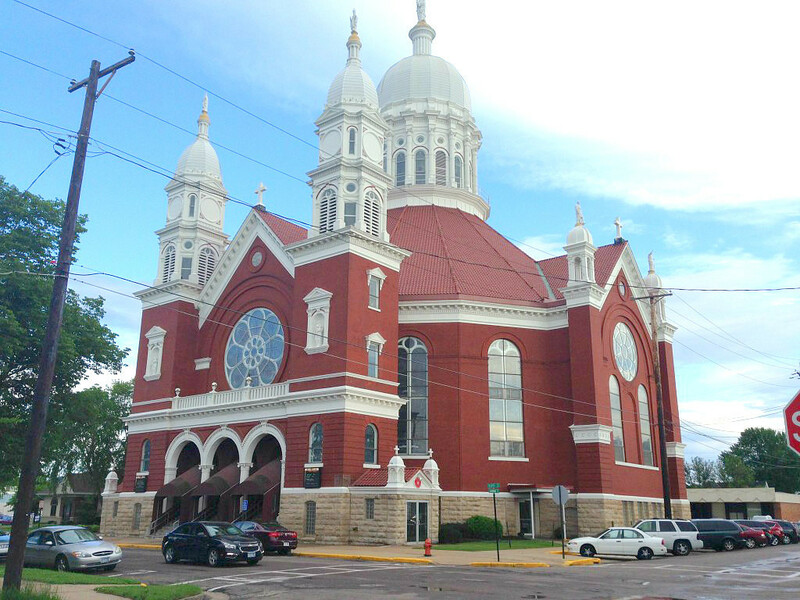 Its parish history was primarily made up of late 1800’s Polish immigrants upon its inception (Minnesota’s largest Polish community), and has only grown since. The stunning red-brick Cathedral featured detailed stained-glass windows, white-capped steeples and a large central dome. 7. 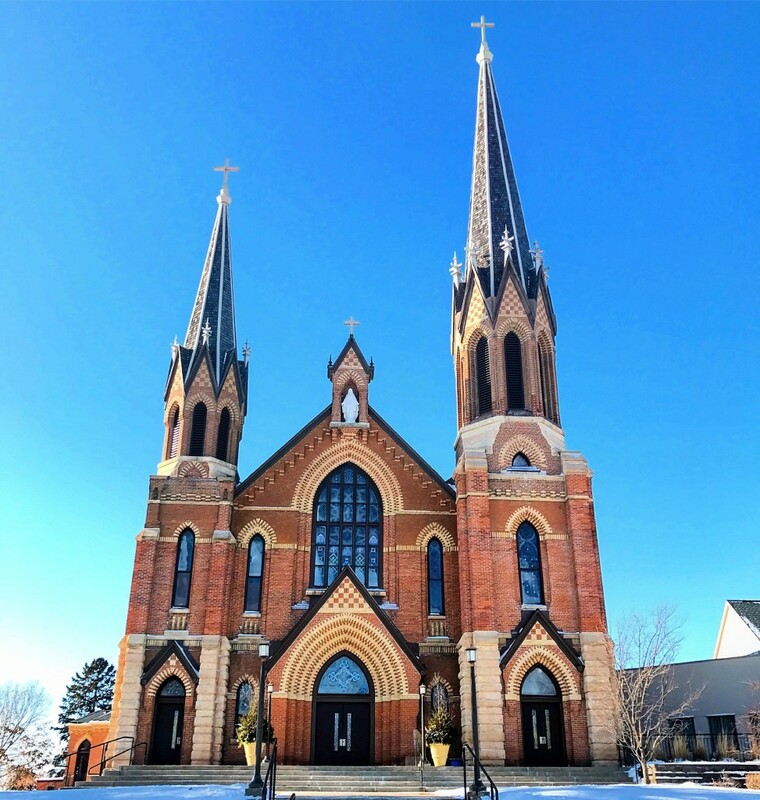 Church of St. Mary, Melrose – The Catholic church in Melrose in the heart of Stearns County is classically beautiful on the outside, with its pair of twin steeples and Romanesque architecture. Construction on it was completed in 1899. But the inside of the church is even more beautiful, with blue-painted ceilings and its ethereal sanctuary dome, designed like stars in the sky. The altar was imported from Germany and detailed stained glass windows line the sides. 6. 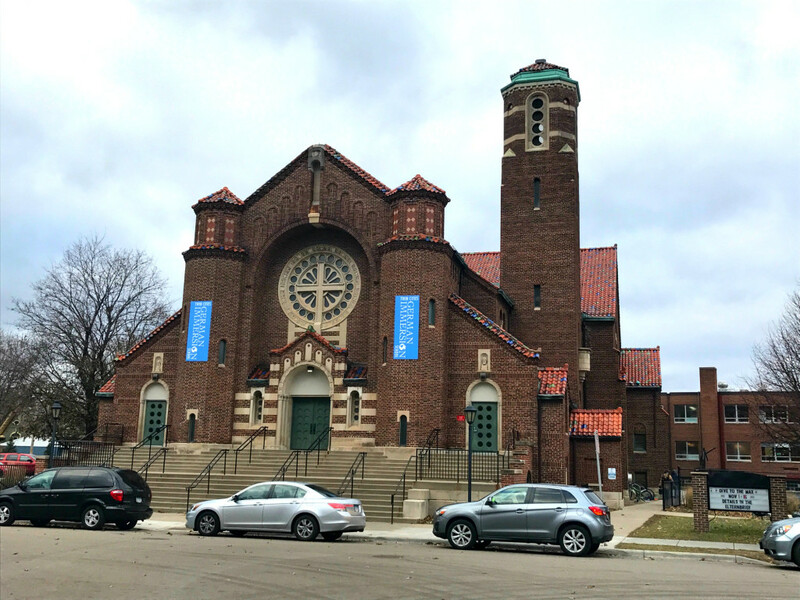 St. Thomas More Catholic Church, St. Paul – Located on Summit Ave, a street in St. Paul lined with impossibly beautiful homes and historic buildings, St. Thomas More Catholic Church fits right in among the standouts. Classic Romanesque Revival architecture with arched windows and a broad, flat steeple make up the exterior with bold, heavy doors and limestone brick. 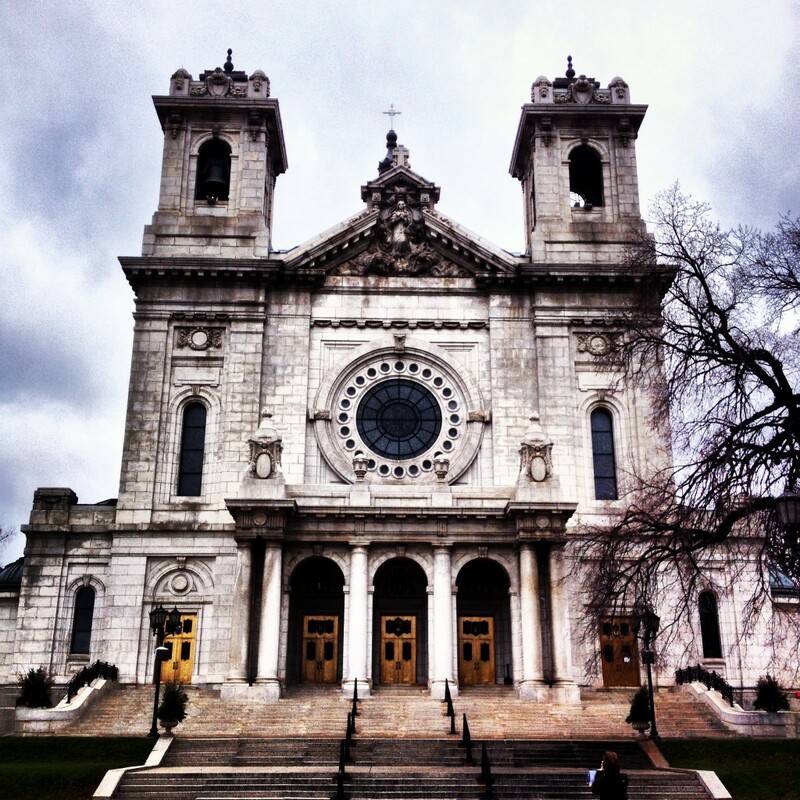 This church is large and imposing, emblematic of St. Paul’s rich history. 5. 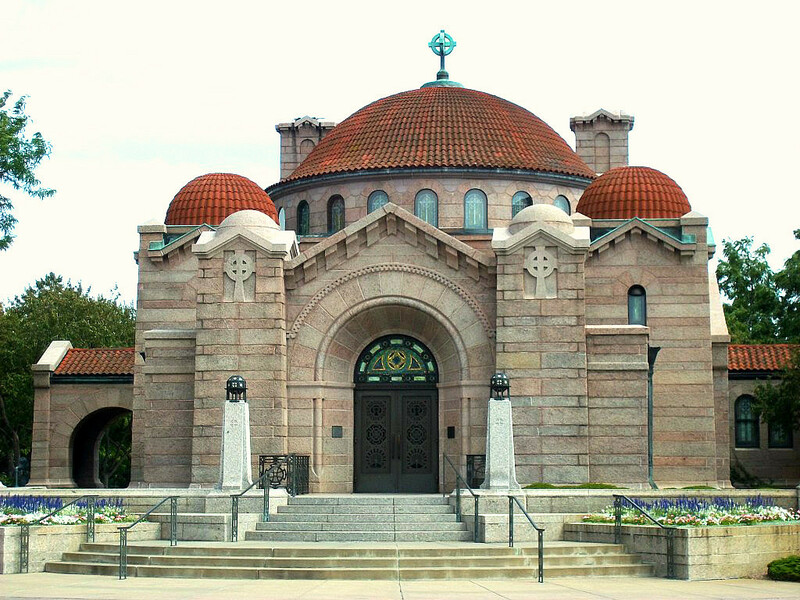 Lakewood Memorial Chapel, Minneapolis – Located inside of Lakewood Cemetery, the Memorial Chapel was built in 1910 and modeled after the Hagia Sophia in Istanbul, Turkey and serves as the architectural focal point of the cemetery. Like many buildings on this list, it is listed on the National Register of Historic places. Its chapel dome is 65 feet high and ringed with stained-glass windows that serve as a sundial telling the time of day and season. The interior also features a mosaic made of marble, colored stone, and glass fused with gold and silver. 4. Cathedral of the Holy Trinity, New Ulm – The elaborate Cathedral in beautiful New Ulm is designed in the Baroque-style of architecture, with a clock tower at the top of its central steeple and white-trimmed red brick construction. The interior is equally as impressive, with an apse featuring paintings of the twelve apostles, Christ, and his angels and gold-trimmed columns in the nave. The structure was built in 1896 and is surprisingly not listed on the National Register of Historic Places. 3. 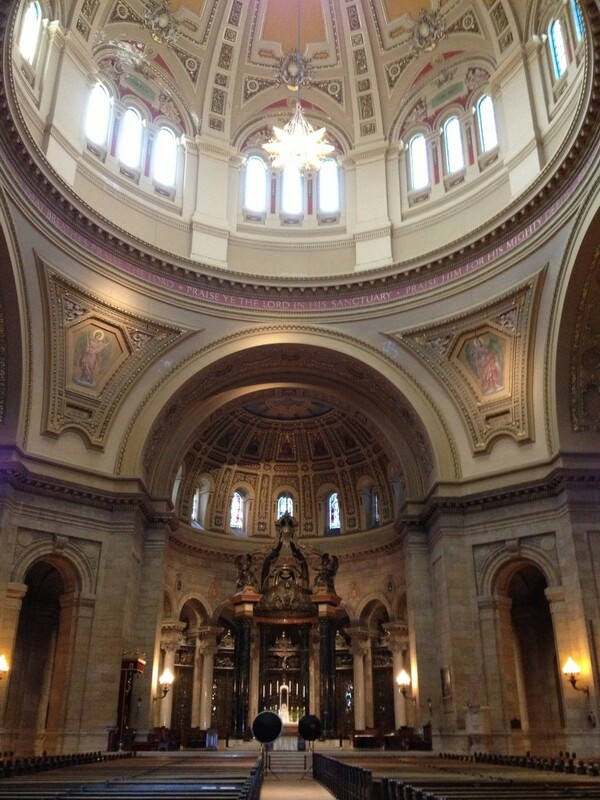 Basilica of St. Mary, Minneapolis – The Minneapolis landmark Basilica was built in the early 1900s and displays examples of Baroque and Beaux-Arts architecture. The inside is incredibly ornate and wonderfully detailed, as one would imagine, and the Basilica holds a music festival on the grounds each summer called the Basilica Block Party as a fundraiser for the structure and local charities. This is the most beautiful and historic church in Minneapolis. 2. 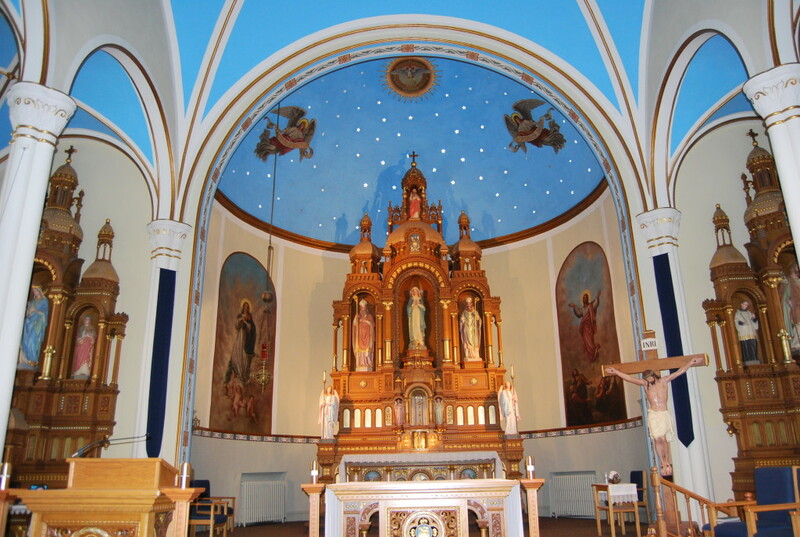 Church of the Sacred Heart, Freeport – Easily the most ornate interior of any church in Stearns County, the Church of the Sacred Heart in the small town of Freeport also topped our list of Stearns County Churches awhile back too. Small and just out sight from the interstate, the beautiful little church in Freeport must be experienced in person to appreciate the arresting beauty of its interior design. 1. 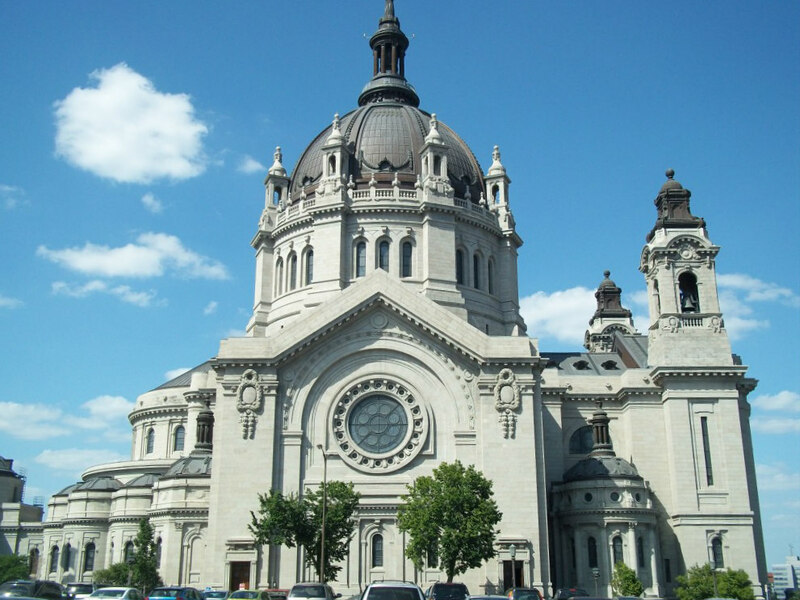 Cathedral of St. Paul, St. Paul – Without a doubt, the most beautiful church and possibly most beautiful building in all of Minnesota is the grand Cathedral at the top of Summit Hill overlooking downtown St. Paul. Built in the early 1900’s, it is the third largest church in the United States. 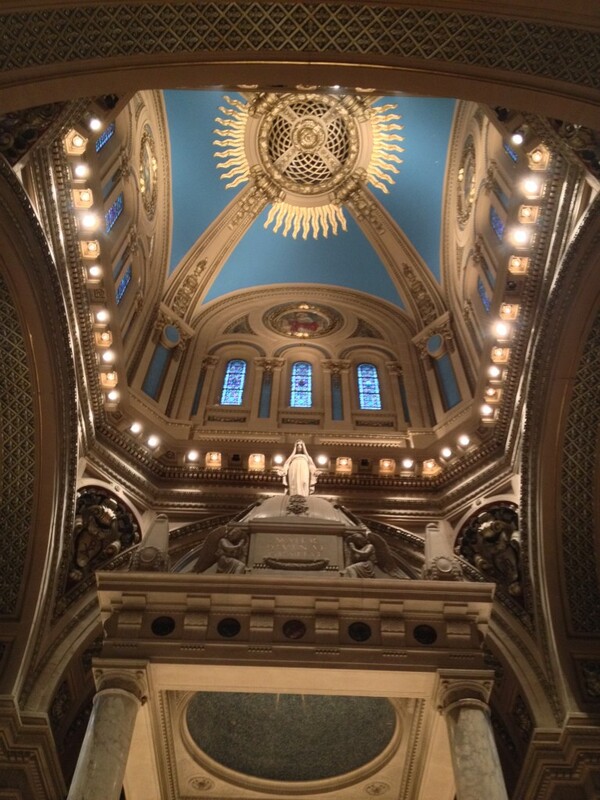 This magnificent structure, modeled after French churches in Paris, features French Renaissance and Classical themes with an 186-ft high dome in the center. Did we miss any that should be listed in our next installment? Let us know below! These are beautiful. I would also suggest the East Union Lutheran Church in Carver, MN. Beautiful churches. 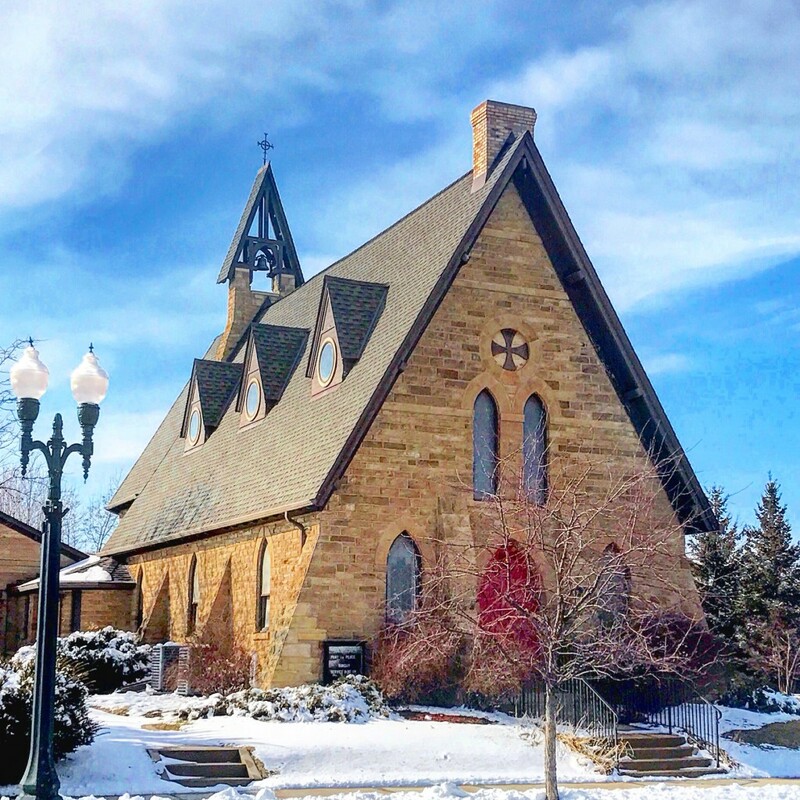 You may also want to check out First Lutheran Church in Morris, Minnesota. The stained glass windows in the Fireside Room and in the front of the sanctuary are well worth the trip. I think you really missed out by excluding Immaculate Conception in New Munich. Garrison Keillor described it as “a mighty architectural shout, an exuberant brick crescendo meant to astonish farmers and shopkeepers for all time and bring doubters to their knees.” It really is an amazing edifice for such a small town. New Munich has the best church in MN. With the stain glass windows. You sit in church in the morning and watch the sun come up. That is why I like to sit in the back. Yes, I’m glad to see Freeport on the list as I grew up get both New Munich and Freeport churches. But, New Munich is stunning and should have been one of the finalists. Maybe they didn’t visit it because it’s more off the beaten path. I always tried to figure out which of the two were more beautiful and you really can’t pick. They are both amazing especially considering they are sitting in tiny towns! St. Peter’s Catholic church Gentily MN has a lot of visitors ! It is sad to know that after a fire at St. Mary’s in Melrose in 2016 left the interior of the church damaged, a few individuals would like to demolish the structure and build a new “modern” church. The building has remained unused for over a year, while most residents plead for repairs to begin. Awesome! Happy to see St Mary’s in Melrose, my sacramental church. Sad for the loss on the interior due to a tragic fire last year. Sleepy Eye St. Mary’s should be on the list. It is unbelievable ornate original full wooden altars with statues murals. 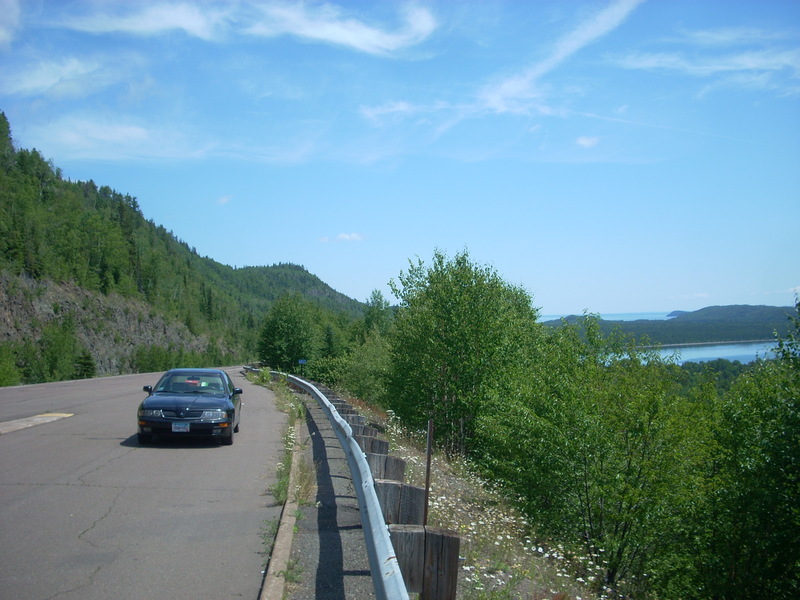 A must see of Hwy 14 southern Minnesota. They give tours. 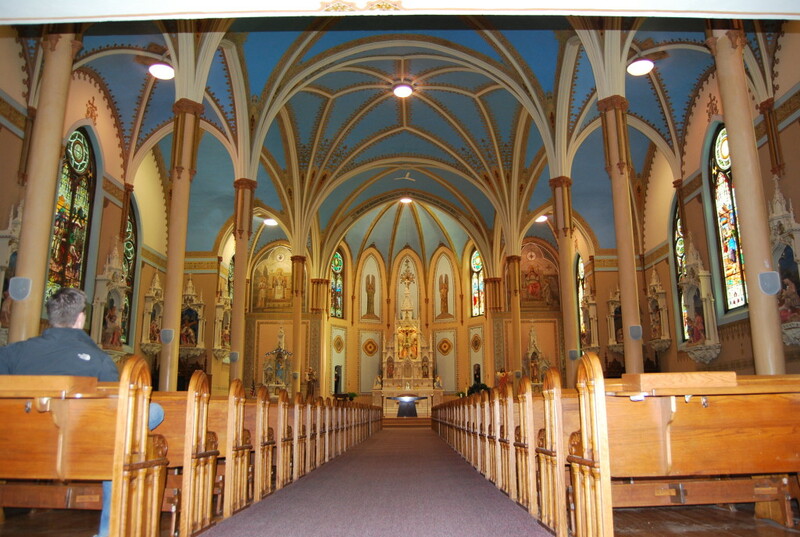 I wish someone forward this to the Diocese and bishop of St.Cloud, which points out the beauty of St.Mary’s in Melrose..BEFORE the fire, so they stop wasting time and get on with repairs and renovations! The exterior was not damaged, and the beautiful interior is well worth saving and redoing. 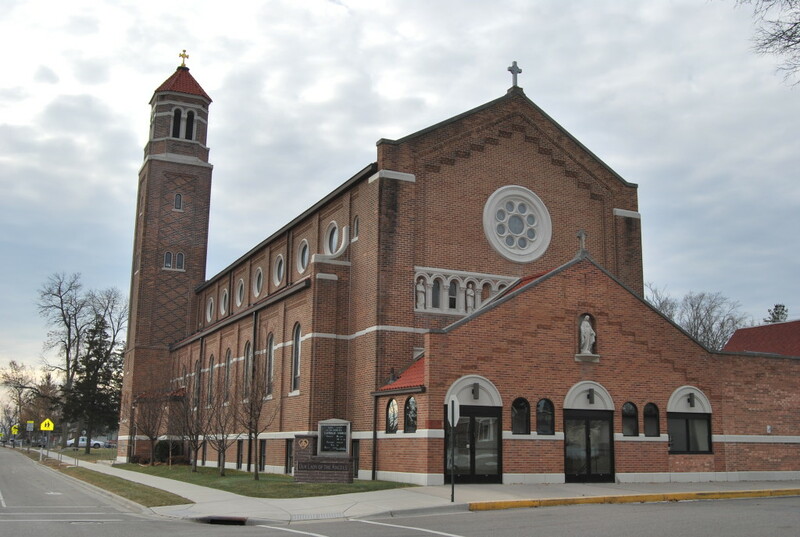 A new modern church would cost tons more, and never replace our beloved St.Mary’s!! All beautiful. The Catholic church in Graceville MN (Big Stone County) is awesome inside and outside too. 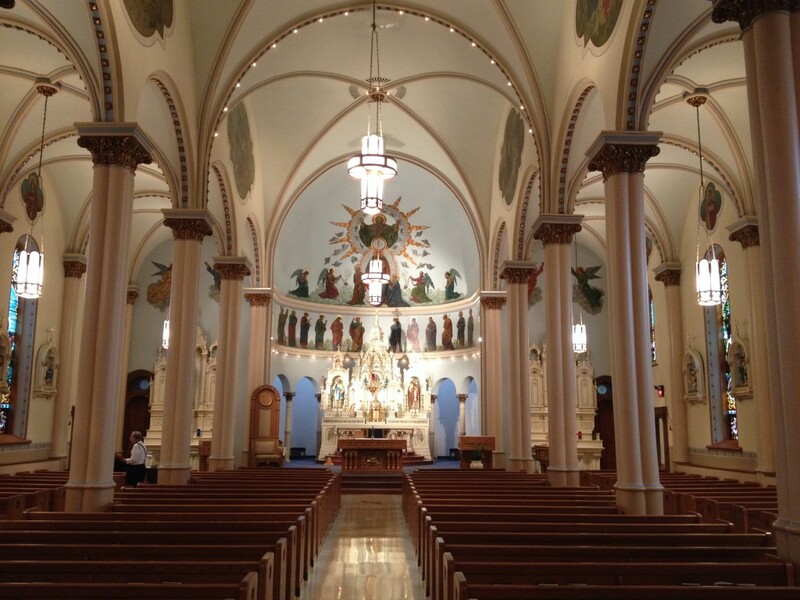 Holy Cross in NE Mpls is beautiful!!!!! Our Lady of Victory chapel on the campus of the university of st Catherine in st Paul is a marvel completed in 1923 in less than 3 yrs. modeled after St Trophime in Arles , France. Features Batchelder tiles and Romanesque arches. In a state full of beautiful churches it has to be hard to pick out a top 25. 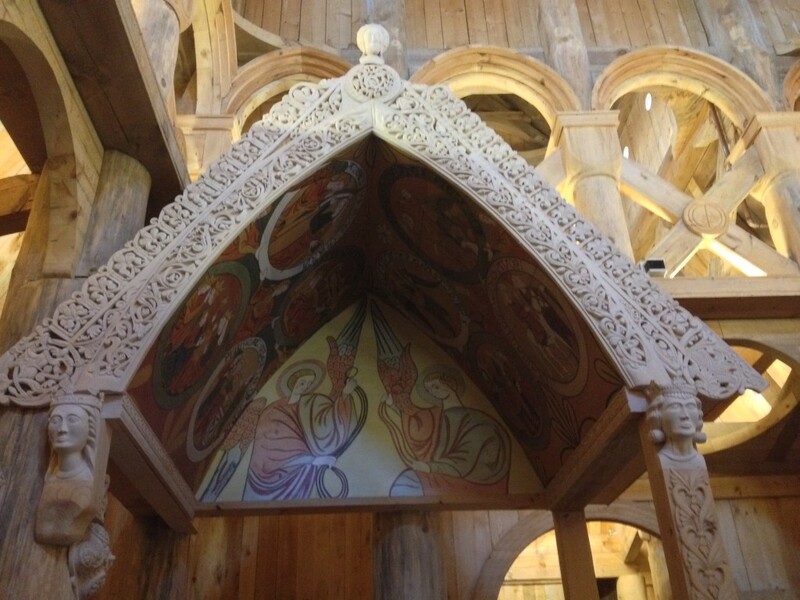 I find the Catholics and Episcopalians tend to be more artistic in church design but the Orthodox do also. I really think St Mary’s Orthodox Cathedral in NE Minneapolis should have made this list. The interior is absolutely stunning. 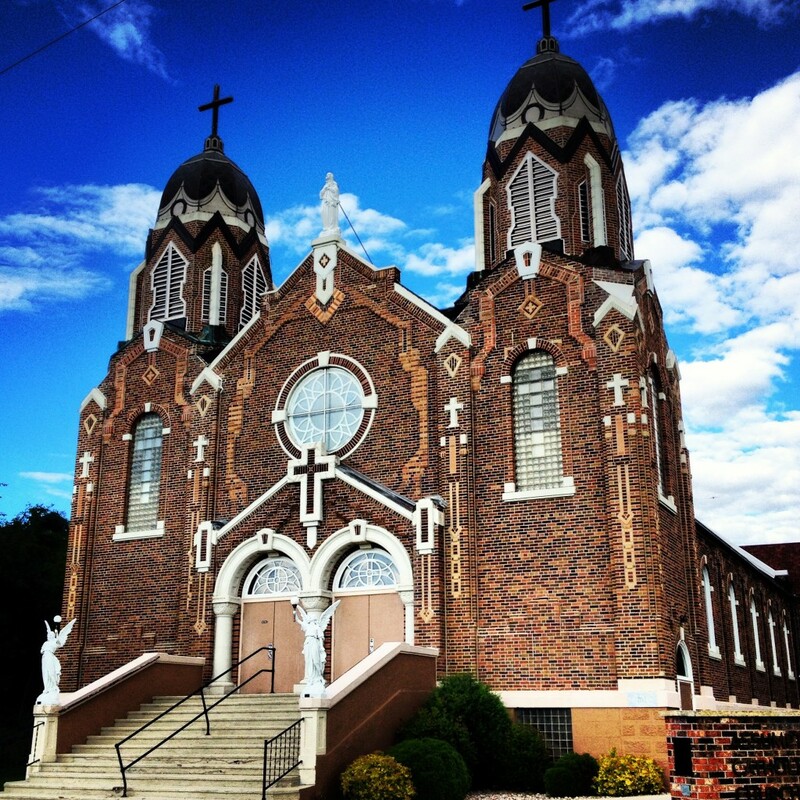 A more humble example, to judge from the exterior, is Holy Trinity Orthodox Church in St Paul. But the interior is like a trip into the celestial spheres. 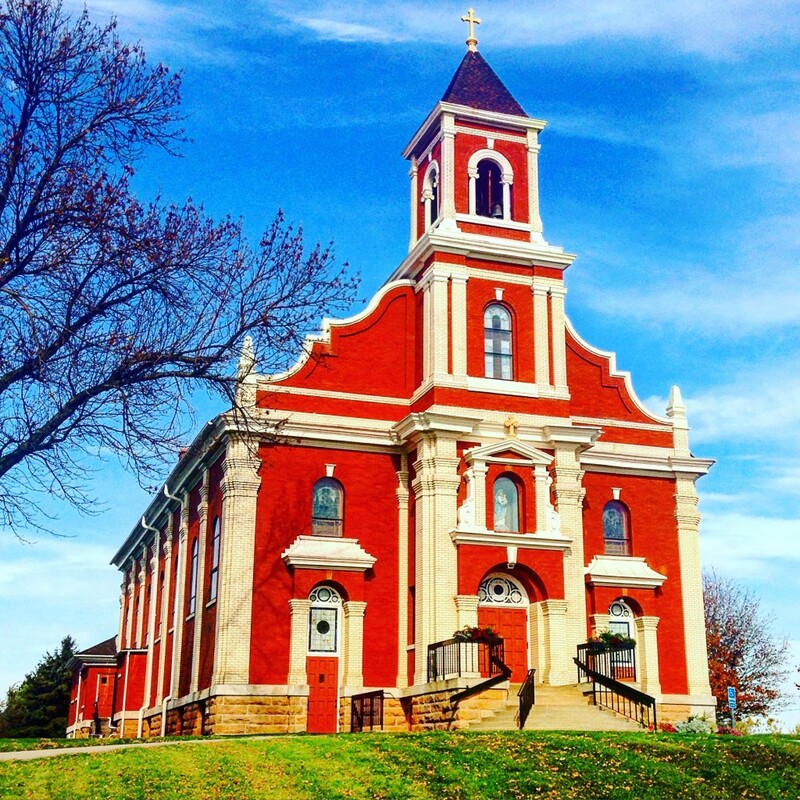 St Aloysius church in Winona had a complete restoration a few years back. TV’s Jason Lewis had a story on it. This church is gorgeous–reminds me of the churches in Italy. 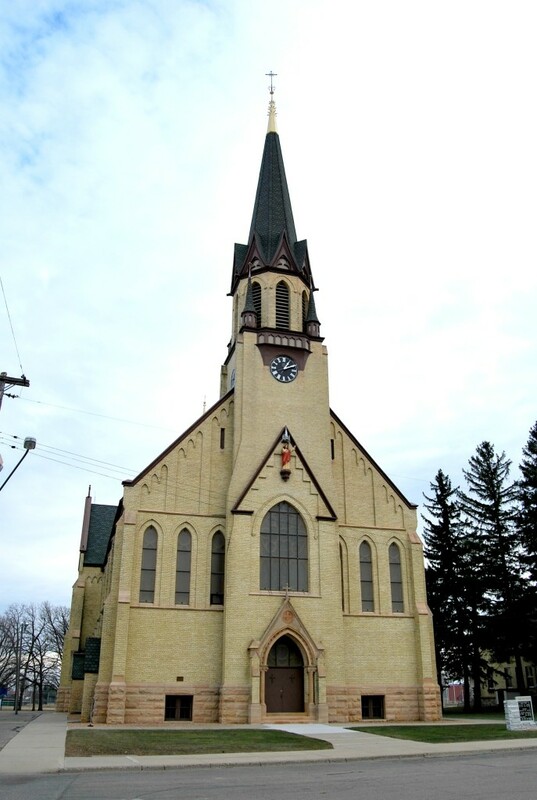 I grew up attending Sacred Heart Church in Freeport, MN which is #2 in the top 25 churches selected! It is a gorgeous church with the most beautiful stained glsss windows and ornate, huge statuesque Stations of the Cross on the upper walls throughout the church! It is truly a masterpiece! So much history there! The church in nearby town of New Munich is also similar in design and very beautiful! 1. The former SACRED HEART CATHEDRAL complex, at Second Ave. West and Fourth Street. 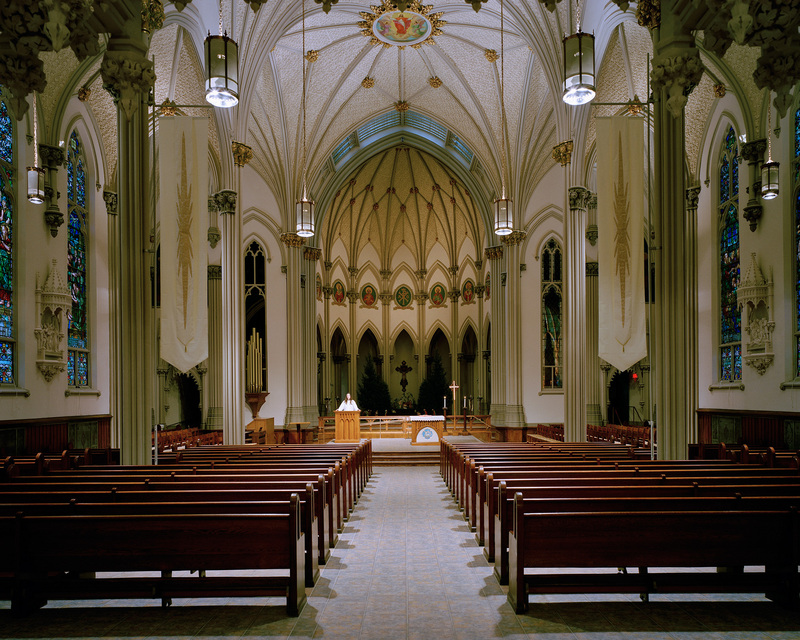 The former Cathedral is now Sacred Heart Music Center which houses it’s original 1898 A.B. Felgemaker pipe organ. The Sacred Heart School is the Damiano Center, a social service organization, and the Christian Brothers’ residence is Alicia’s Place, a women’s shelter. 2. St Mary, Star of the Sea Church at Fourth Avenue East and Third Street has preserved much of it’s its ornate interior, and Lyon & Healey pipe organ, as they were in 1904. 3. First Presbyterian Church at Third Avenue East and Second Street is Duluth’s oldest congregation, formed in 1869, one year before that of Sacred Heart Cathedral (above). FPC has several windows created by Ann Weston and Louis Comfort Tiffany.